This is a tribute to the British Armed Forces' role in helping keep the Republic of Korea a free nation. "We shall fight them on the beaches, we shall fight them on the landing grounds, we shall fight them in the streets and in the fields, and we shall never surrender." These words were spoken by Churchill, and referred to the British resistance against the Nazi Blitzkrieg; but they also reflect the courageous defiance shown by the ROK and its allies against Kim Il Sung's attack. The Scottish Korean War Memorial is in a beautiful glen west of Edinburgh. It has a Korean building and lovely well laid out paths in the grounds. The names of all the Scottish dead are recorded there. ​A new memorial to the conflict often dubbed ‘the forgotten war’ has been unveiled today at a ceremony in central London. 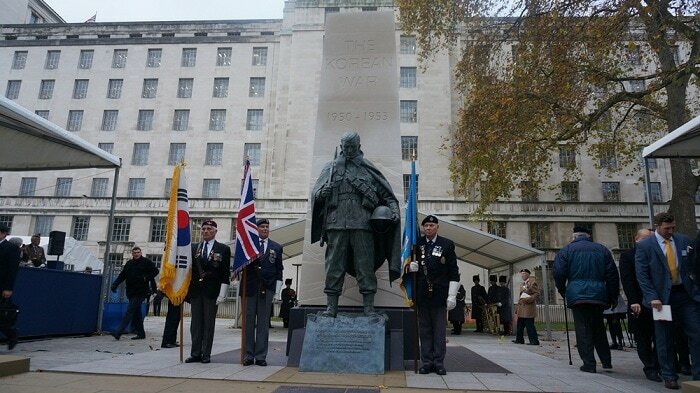 The Korean War Memorial, a gift from the Republic of Korea (ROK) to honour the British troops that served between 1950 and 1953, is in the form of a bronze statue of a British soldier by sculptor Philip Jackson. It has involved the British Korean Veterans Association, the Embassy of the Republic of Korea in London and the Korean Ministry of Patriots’ and Veterans’ Affairs as well as The Lady R Foundation and the British Government. Over 500 guests, including 320 veterans, watched HRH the Duke of Gloucester lead a ceremony of commemoration alongside Defence Secretary, the Rt Hon Michael Fallon MP, and the Republic of Korea’s Minister of Foreign Affairs, Mr Yun Byung-se. The Defence Secretary said: We must never allow the notion of a ‘forgotten war’ to take hold. Where Britain’s armed forces put their lives on the line for their country, this must be commemorated, and in the right way. The Korean War was the first ever UN action against aggression, and so has enormous international significance. We will never forget the sacrifices made by our soldiers – losing their lives, sustaining injuries or becoming prisoners of war. I am therefore grateful to the government of the Republic of Korea for contributing such an impressive Memorial. It is fitting that, in the year we mark the centenary of World War I, we also remember those British soldiers who were deployed over 30 years later to ensure the freedom of millions of people in Korea and beyond. Around 82,000 British service personnel were deployed during the Korean War, with over 1000 of them losing their lives. Most of the British dead are buried in the UN Memorial Cemetery outside Busan in the Republic of Korea. Today’s ceremony has been arranged by the Embassy of the Republic of Korea in London. Members of the Embassy attended the unveiling, together with Mr Yun Byung-se and representatives from the UK’s Ministry of Defence and Foreign and Commonwealth Office. Foreign Office Minister, the Rt Hon Hugo Swire MP said: It is absolutely right that veterans of the Korean War now, finally, have a permanent memorial in our capital city, and I am proud to be able to honour their memory. Our diplomatic relations with the Korean Peninsula go back over 130 years. But it was through the experiences of this war that the UK and Republic of Korea forged a truly profound friendship that still endures to this day. Fittingly, on the day on which we unveil the memorial, we are taking the relationship to a new level with the first ever ministerial UK-ROK Strategic Dialogue, hosted by the Foreign Secretary. As well as being an economic powerhouse in Asia, the Republic of Korea is an important partner for the UK on many key global issues, and we look forward to ever closer cooperation. Further information The Memorial is a bronze statue of a British soldier by sculptor Philip Jackson, standing in front of an inscribed and carved obelisk of Portland stone on a base of Welsh slate. The carvings in the obelisk include an image of the Korean Peninsula, surmounted by the flag of the Republic of Korea and behind the statue of the soldier, an artistic interpretation of Korea’s mountainous landscape. On the north face of the obelisk, the emblem of the United Nations is on top of the following inscription: The Korean War was the first UN action against aggression. The UN forces that fought the North Korean invasion were drawn from 21 countries. Although exhausted and impoverished after the Second World War, Britain responded immediately by providing strong naval, army and air forces and became the second largest contributor after the United States. A distant obligation honourably discharged. An inscription on the south face is surmounted by the Union flag and reads: In this fierce and brutal conflict those who fought included many Second World War veterans reinforced by reservists and young national servicemen. The land battle was fought against numerically superior communist forces, the terrain was mountainous and the weather extreme. 81,084 British servicemen served in the theatre of operations. 1,106 were killed in action, thousands were wounded and 1,060 suffered as prisoners of war. 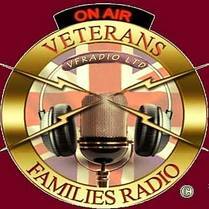 The British Korean Veterans Association was formed in 1981 from the amalgamation of two recently formed associations. Over the last thirty years, it has flourished, developing strong links with Korea, organising revisits for veterans and ensuring the British contribution is not forgotten. Now, however, age means there are fewer volunteers to take on key functions at the national level. A decision was taken in October 2013 to wind up the BKVA’s national role following the Memorial Unveiling and the laying up of the National Standard at York Minster on 18 January 2015.